This Ethernet Shield which is based on the Wiznet W5100 Ethernet Chip gives you an easy way to get your for Arduino Online. 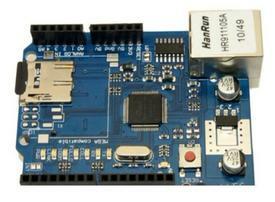 It is directly supported by for Arduino official Ethernet Library. It adds a micro-SD card slot, which can be used to store files for serving over the network. It is compatible with the for Arduino Duemilanove (168 or 328), Uno as well as Mega (1280/2560) and can be accessed using the SD library. A simple web server that shows the value of the analog input pins. With this Ethernet Shield, for Arduino board can be used to connect to internet. Can be used as server or client. Directly plug puzzle board, no soldering required. This is the latest version of the Ethernet Shield. 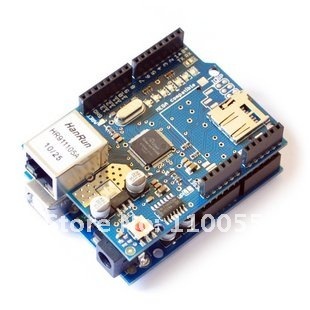 to get For Arduino Online. It is directly supported by official Ethernet Library. It adds a micro-SD card slot, which can be used to store files for serving over the network. be accessed using the SD library. The Wiznet W5100 provides a network (IP) stack capable of both TCP and UDP. It supports up to four simultaneous socket connections. Use the Ethernet library to write sketches which connect to the internet using the shield. Fits all version for arduino Main board,2009,UNO, mega 1280, mega 2560. Size:7cm x 5.4cm x 2.4cm - 2.76inch x 2.12inch x 0.94inch.